As long as the surface of the tarmacadam driveway or patio is relatively clean, sound and dry, and not seriously cracked or damaged, it can be coated with one of a number of proprietary products available on the market. Versions can be obtained at large DIY stores but there are also specialist companies which offer a restoration and refurbishment service. Some products are referred to as tarmac paint, restorer or sealer and the best should both re-colour the surface and seal it to offer protection from UV light. The various products available claim to prolong the life of the surface, protect against wear and tear and inhibit weed growth but for most homeowners, the major benefit will be aesthetic. Many of the market leaders in the manufacture and supply of tarmacadam restoration and rejuvenation products go to great lengths to make homeowners aware that their products are not simply paints. Tarmaseal™ is one such excellent product and can be considered a substitute for re-surfacing, albeit with a shorter lifespan. 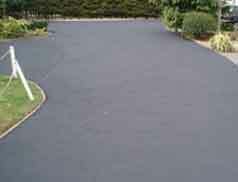 Before products such as Tarmaseal™ are applied, the existing tarmacadam driveway surface should be thoroughly cleaned. Moss, weeds and algae should be pre-treated with a fungicidal wash and the surface cleaned with a pressure washer and brush. Cracks should be sealed with bitumen paint and small pot holes can be filled with cold bitmac which is available at large DIY stores. When first laid, tarmacadam has a high resin content which makes it flexible and resistant to cracking. Over time though, moss develops, the surface fades, resins dry out making the surface brittle and cracks appear. Tarmaseal™ is applied by a roller and soaks into the surface replacing lost resins making the surface water resistant. 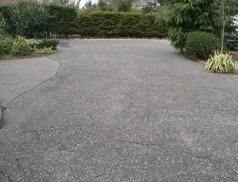 Restoration and rejuvenation of a tarmacadam driveway or patio area should only ever be considered a short term fix and is no substitute for resurfacing with 30 mm of new bitmac, which in turn is no substitute for a full dig out and replacement of the aggregate, dense bitmac sub-base and new wearing course. Which option is chosen should be determined by the condition of the existing driveway and how many times it has already been repaired. It is so often however, determined by the homeowner’s budget. Surveyors can advise you on the correct course of action in your particular circumstances.